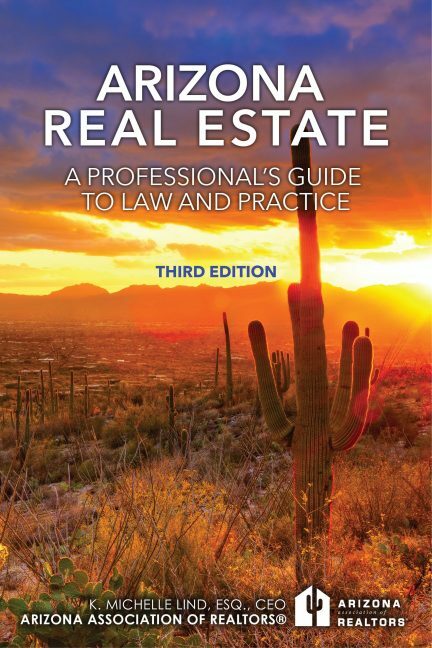 Arizona Real Estate: A Professional’s Guide to Law and Practice – Third Edition Now Available! Written by Arizona REALTORS® CEO K. Michelle Lind, Esq. The third edition was released in March 2018, and is available in both paperback and eBook formats. You can highlight and bookmark areas so that you can easily refer back to that section. A must read for every Arizona real estate broker and agent! This guide includes references to real estate case law, statutes and rules. At the end of every chapter, you will find a list of “Key Points to Remember.” For easy reference, the book is fully indexed. For questions or help downloading the eBook please contact Christina Smalls at christinasmalls@aaronline.com.